Burkholderia cepacia (B. cepacia) is an important human pathogen, first isolated in cystic fibrosis patient and associated with serious health issues such as wound infection, bacteremia, catheter-related urinary infections and endocarditis . B. cepacia initially know as Pseudomonas cepacia referred as the phytopathogen responsible for a bacterial rot of onions commonly found in soil and moist environments . B. cepacia now emerged as an opportunistic human pathogen especially for immunocompromised and hospitalized patients . B. cepacia complex is the group of more than ten bacteria with similar phenotypes but they differ genetically. They are responsible for high morbidity and mortality rate of cystic fibrosis patients mainly due to respiratory tract infections. Among this B. cepacia complex, specifically B. cenocepacia is associated with serious cepacia syndrome like high fever, overwhelming septicemia and necrotizing pneumonia. Mortality rate among these patients are very high as 62-100% . During the last few decades, incidence of microbial resistance has increased which leads to generates multi-drug-resistance (MDR) organisms. Cases of MDR infection has been increased suddenly, which leads to ineffective treatment and risk of spreading infections. Resistance in microorganism against antimicrobials develops naturally. Although MDR development is a natural phenomenon, but extensive rise in the number of immunocompromised patients leads to examine it and elucidate the molecular mechanism of organism during infection . In addition, B. cepacia is very difficult to treat due to its highly resistant pattern against available antibiotics. Generally combination therapy is preferred by the physicians, which consist of meropenem along with other antibiotics such as amikacin, minocycline or ceftazidime . However, some pathogenic strains of B. cepacia are resistant to above drugs combination and are difficult to treat. So, other treatment modalities must be adopted like multiple combination bactericidal therapy to assess whether greater effect can be achieved when more than two drugs are given together . Recently, an alternate system called biofield treatment is reported to alter the susceptibility of microorganism towards existing medicines . The conversion of mass into energy is well known in literature for hundreds of years that was further explained by Fritz  and Einstein . The energy can exist in various forms that can be produced from different sources such as potential, electrical, kinetic, magnetic, and nuclear. Human nervous system consists of neurons that transmit information in the form of electrical signals. Moreover, as per Ampere-Maxwell law, electromagnetic field defines as when electrical signals fluctuate will generate magnetic field with respect to time. It involves electromagnetic bioinformation for regulating hemodynamics (that is, the way the body system functions), hence it is known as "biofield" . Mr. Trivedi has the ability to harness the energy from environment or Universe and can transmit into any living or nonliving object(s). The objects always receive the energy and responding into useful way that is called biofield energy and the process is known as biofield treatment. Mr. Mahendra Trivedi biofield is well-known to change the various physicochemical characteristics of metals and ceramics [12-14]. The quality and yield of several agriculture products have also been improved with several folds after biofield treatment [15-17]. Exposure to biofield energy caused an increase in medicinal property, growth, and anatomical characteristics of Ashwagandha . Further, the biofield treatment has considerably altered the susceptibility of antimicrobials and biotype of microbe [19-20]. By considering the above mentioned facts and literature reports on biofield, the present work was undertaken to evaluate the impact of biofield treatment on antimicrobials susceptibility, biochemical reactions pattern, and biotype of MDR strain of B. cepacia. MDR strain of B. cepacia was collected from stored stock cultures of clinical sample in Microbiology Lab, Hinduja Hospital, Mumbai. MDR strain was divided in two groups i.e. control and treatment. Treatment group, in sealed pack was handed over to Mr. Trivedi for biofield treatment under laboratory conditions. Mr. Trivedi provided the treatment through his energy transmission process to the treated groups without touching the samples. The biofield treated sample was returned in the similar sealed condition for further analysis on day 10 with respect to control using the standard protocols. After biofield treatment, treated sample was analyzed for antimicrobial susceptibility, biochemical reactions and biotype number using MicroScan Walk-Away® (Dade Behring Inc., USA) and Negative Break Point Combo (NBPC 30) panel with respect to control groups. Antimicrobial susceptibility pattern of B. cepacia was studied using MicroScan Walk-Away® NBPC30 as per manufacturer's instructions. The antimicrobial susceptibility pattern (S: Susceptible, I: Intermediate, and R: Resistant) and minimum inhibitory concentration (MIC) values were determined by observing the lowest antimicrobial concentration showing growth inhibition . The antimicrobials were procured from Sigma Aldrich, USA and used in the susceptibility assay viz. amikacin, aztreonam, cefepime, cefotaxime, ceftazidime, ceftriaxone, chloramphenicol, ciprofloxacin, gentamicin, imipenem, levofloxacin, meropenem, piperacillin, piperacillin/tazobactam, tetracycline, ticarcillin/k-clavulanate, tobramycin, and trimethoprim/sulfamethoxazole. Biochemical study of B. cepacia was determined by MicroScan Walk-Away® system in both control and treated groups. Biochemicals were procured from Sigma Aldrich, USA and used in the study viz. acetamide, adonitol, arabinose, arginine, cetrimide, cephalothin, citrate, colistin, esculin hydrolysis, nitrofurantoin, glucose, hydrogen sulfide, indole, inositol, kanamycin, lysine, malonate, melibiose, nitrate, oxidation-fermentation, galactosidase, ornithine, oxidase, penicillin, raffinose, rhaminose, sorbitol, sucrose, tartarate, tryptophan deaminase, tobramycin, urea, and Voges-Proskauer . The biotype number of B. cepacia control and treated sample were determined by MicroScan Walk-Away® processed panel data report with the help of biochemical reaction data . Results of antimicrobial sensitivity pattern and MIC of B. cepacia are summarized in Table 1 and 2 respectively. The biofield treatment on MDR strain of B. cepacia showed a significant change in sensitivity pattern of different antimicrobials such as ceftazidime, ciprofloxacin, imipenem and levofloxacin changed from I→R. Aztreonam sensitivity converted from R→I while meropenem and piperacillin/tazobactam changed from S→R (Table 1). Table 1: Effect of biofield treatment on Burkholderia cepacia to antimicrobial susceptibility. Decrease in MIC value was reported in case of aztreonam (16 µg/mL) and tetracycline (8 µg/mL) after biofield treatment as compared to control. MIC value was increased after biofield treatment in case of ceftazidime, chloramphenicol, ciprofloxacin, imipenem, levofloxacin, meropenem, and piperacillin/tazobactam (Table 2). Rest of the tested antimicrobials did not show any change in sensitivity pattern and MIC value. Overall, study results showed a change of 38.9% in susceptibility pattern and 30% in MIC values of tested antimicrobials after biofield treatment. All these changes were observed after 10 days of biofield treatment as compared to control group. Table 2: Minimum inhibitory concentration (MIC) of Burkholderia cepacia for tested antimicrobials. Table 3 summarizes the biochemical reactions. Biochemicals were denoted with codes in control and biofield treated group on day 10. Biochemical study showed positive reaction (i.e. from (-) negative to (+) positive) in acetamide, arginine, and malonate while negative reaction (i.e. from (+) positive to (-) negative) in case of colistin, lysine and ornithine after biofield treatment as compared with control. Overall, biochemical study showed the alteration of 18.2% after biofield treatment. Table 3: Effect of biofield treatment on biochemical reactions of Burkholderia cepacia. Biochemical tests result revealed a change in biotype number in treated group on day 10 (02063736) with green pigmentation as a special character as compared to control (05041776) which was having a yellow pigmentation. In treated group, a new species was identified as Pseudomonas aeruginosa, as compared to control (Table 4). Table 4: Effect of biofield treatment on bio typing of Burkholderia cepacia. B. cepacia is a member of a group known as B. cepacia complex causing “cepacia syndrome”, form of progressive necrotizing pneumonia. It was associated with acute systemic infections and may be fatal in some case . The emergence of MDR of B. cepacia harbored a global health problem and an emerging drug resistant microorganism commonly associated with immunocompromised patients or patients with underlying lung disease, such as cystic fibrosis. Due to continuous new drug discovery in antimicrobials, rate of MDR microorganism increased causing serious health problems. Cell membrane alterations in MDR microorganism results in decreased uptake of antimicrobials , overexpression of drug target enzymes results in mutation , and drug efflux pumps remains the predominant mechanism in multi-drug resistant organisms . Nowadays, B. cepacia acquires resistance against broad range of antibiotics, so it was very difficult to start drug therapy in chronically infected patients . Due to this, use of combination therapy is suggested rather than monotherapy against B. cepacia infection. United States in 2002, demonstrated most prevalent infection among B. cepacia complex was B. cepacia followed by B. multivorans as the next most dominant . Contaminated disinfectants, ventilators, antiseptics, and different types of medical equipment were also responsible for B. cepacia infection. Even, person-to-person spread has also been documented. Best drug of choice in B. cepacia infection is co-trimoxazole, followed by ceftazidime and meropenem, alone or in combination with other antibiotics . Experimental results showed a significant alteration in sensitivity pattern after biofield treatment in azetronan, ceftazidime, ciprofloxacin, imipenam, levofloxacin, meropenam, and piperacillin/tazobactam. 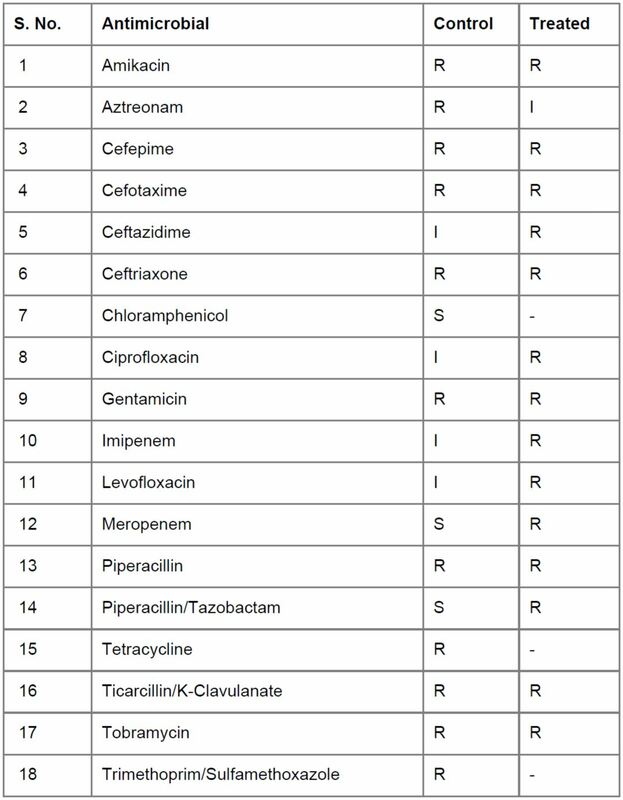 Apart from above antimicrobials, alteration in MIC values were also reported in chloramphenicol and tetracycline. Above results suggest that the Mr. Trivedi’s biofield has the ability to harness energy from environment and can transmit it into microorganism. However, biofield treatment varies according to energy expressed, and information carried forward. Biofield treatment in B. cepacia possibly made some alterations either in some enzymatic pathways of microorganism or a change at genetic level, which leads to alter the phenotypic features like sensitivity pattern and MIC values in biofield treated group. Several phenotypic identification tests were available to differentiate the Burkholderia species. Experimental identification of B. cepacia was performed using a series of biochemical analysis. Basic characteristics of B. cepacia in biochemical reactions are presence of lysine, colistin, oxidase activity, and ornithine decarboxylase activity. Pigment production, hemolysis, and growth at 42°C temperature are other general characters . Biofield treatment showed a significant alteration i.e. negative reaction in biochemical such as lysine, colistin, and ornithine decarboxylase activity which are the basic characters of B. cepacia. Besides these changes, acetamide, arginine and malonate showed positive reactions after biofield treatment. Biotyping was performed using an automated system and found a significant changed in biotype number (02063736) in treated group on day 10, and organism identified as Pseudomonas aeruginosa after biofield treatment as compared to control (biotype number, 05041776). Pigment production is the special character of B. cepacia, biofield treatment showed a significant change i.e. green pigment in treated group as compared to yellow pigment in control (Table 4). Biofield therapies in biomedical health care system are very popular and claims to enhance human well-being and other metabolic pathways . National Center for Complementary and Alternative Medicine (NCCAM), now defined biofield therapies in subcategory of energy therapies as one of the five complementary medicine domain . Biofield treatment in microbiology was reported a significant alteration in phenotypic characteristics of microorganism. Alteration in microorganism might be due to the involvement of electromagnetic field that acts on receptor protein at molecular or genetic level. Biofield treatment, modifies ligand-receptor interaction which causes alteration in phenotypic characters. Scientist studied that at extremely low frequency, electromagnetic fields could alter transmembrane Ca2+ concentration of receptor proteins which causes damage and developmental defects in different organs . Results showed that, biofield treatment induces changes in susceptibility pattern of antimicrobials, MIC values, biochemical reactions, and biotype number of MDR strain of B. cepacia. Overall data concludes that biofield treatment has shown significant impact on antimicrobial susceptibility pattern, MIC values, biochemical reactions and biotype number of MDR strain of B. cepacia. In treated group, a new species was identified as Pseudomonas aeruginosa, as compared to control, B. cepacia. Based on the study outcomes, biofield treatment could be applied to alter the sensitivity pattern of antimicrobials, against multi drug resistance of B. cepacia. 1. Holmes A, Govan J, Goldstein R (1998) Agricultural use of Burkholderia (Pseudomonas) cepacia: a threat to human health? Emerg Infect Dis 4: 221-227. 2. Burkholder W (1950) Sour skin, a bacterial rot of onion bulbs. Phytopathology 40: 115-117. 3. Thomassen MJ, Demko CA, Klinger JD, Stern RC (1985) Pseudomonas cepacia colonization among patients with cystic fibrosis. A new opportunist. Am Rev Respir Dis 131: 791-796. 4. De Soyza A, Corris PA (2003) Lung transplantation and the Burkholderia cepacia complex. J Heart Lung Transplant 22: 954-958. 5. Singh V (2013) Antimicrobial resistance. Microbial pathogens and strategies for combating them: science, technology and education. Formatex Research Center 1: 291-296. 6. Gibson RL, Burns JL, Ramsey BW (2003) Pathophysiology and management of pulmonary infections in cystic fibrosis. Am J Respir Crit Care Med 168: 918-951. 7. Aaron SD, Ferris W, Henry DA, Speert DP, Macdonald NE (2000) Multiple combination bactericidal antibiotic testing for patients with cystic fibrosis infected with Burkholderia cepacia. Am J Respir Crit Care Med 161: 1206-1212. 8. Trivedi MK, Bhardwaj Y, Patil S, Shettigar H, Bulbule, A (2009) Impact of an external energy on Enterococcus faecalis [ATCC-51299] in relation to antibiotic susceptibility and biochemical reactions-an experimental study. J Accord Integr Med 5: 119-130. 9. Hasenohrl F (1904) On the theory of radiation in moving bodies. Annalen der Physik 15: 344-370. 10. Einstein A (1905) Does the inertia of a body depend upon its energy-content. Annalen der Physik 18: 639-641. 12. Trivedi MK, Tallapragada RR (2008) A transcendental to changing metal powder characteristics. Met Powder Rep 63: 22-28. 13. Dabhade VV, Tallapragada RR, Trivedi MK (2009) Effect of external energy on atomic, crystalline and powder characteristics of antimony and bismuth powders. Bull Mater Sci 32: 471-479. 14. Trivedi MK, Tallapragada RR (2009) Effect of superconsciousness external energy on atomic, crystalline and powder characteristics of carbon allotrope powders. Mater Res Innov 13: 473-480. 15. Shinde V, Sances F, Patil S, Spence A (2012) Impact of biofield treatment on growth and yield of lettuce and tomato. Aust J Basic & App Sci 6: 100-105. 16. Sances F, Flora E, Patil S, Spence A, Shinde V (2013) Impact of biofield Treatment on Ginseng And Organic Blueberry Yield. AGRIVITA J Agri Sci 35: 22-29. 17. Lenssen AW (2013) Biofield and fungicide seed treatment influences on soybean productivity, seed quality and weed community. Agricultural Journal 8: 138-143. 18. Altekar N, Nayak G (2015) Effect of biofield treatment on plant growth and adaptation. J Environ Health Sci 1: 1-9. 19. Trivedi MK, Patil S (2008) Impact of an external energy on Staphylococcus epidermis [ATCC-13518] in relation to antibiotic susceptibility and biochemical reactions-an experimental study. J Accord Integr Med 4: 230-235. 20. Trivedi MK, Patil S (2008) Impact of an external energy on Yersinia enterocolitica [ATCC-23715] in relation to antibiotic susceptibility and biochemical reactions: an experimental study. Internet J Alternat Med 6: 13. 21. Fader RC, Weaver E, Fossett R, Toyras M, Vanderlaan J, et al. (2013) Multilaboratory study of the biomic automated well-reading instrument versus MicroScan WalkAway for reading MicroScan antimicrobial Susceptibility and identification panels. J Clin Microbiol 51: 1548-1554. 22. Lipuma JJ (2005) Update on the Burkholderia cepacia complex. Curr Opin Pulm Med 11: 528-533. 23. Tenover FC (2006) Mechanisms of antimicrobial resistance in bacteria. Am J Med 119: S3-10. 24. He X1, Li S, Kaminskyj SG (2014) Using Aspergillus nidulans to identify antifungal drug resistance mutations. Eukaryot Cell 13: 288-294. 25. Alekshun MN1, Levy SB (2007) Molecular mechanisms of antibacterial multidrug resistance. Cell 128: 1037-1050. 26. Nzula S1, Vandamme P, Govan JR (2002) Influence of taxonomic status on the in vitro antimicrobial susceptibility of the Burkholderia cepacia complex. J Antimicrob Chemother 50: 265-269. 27. Reik R1, Spilker T, Lipuma JJ (2005) Distribution of Burkholderia cepacia complex species among isolates recovered from persons with or without cystic fibrosis. J Clin Microbiol 43: 2926-2928. 28. Avgeri SG1, Matthaiou DK, Dimopoulos G, Grammatikos AP, Falagas ME (2009) Therapeutic options for Burkholderia cepacia infections beyond co-trimoxazole: a systematic review of the clinical evidence. Int J Antimicrob Agents 33: 394-404. 29. van Pelt C1, Verduin CM, Goessens WH, Vos MC, Tümmler B, et al. (1999) Identification of Burkholderia spp. in the clinical microbiology laboratory: comparison of conventional and molecular methods. J Clin Microbiol 37: 2158-2164. 30. Turner JG1, Clark AJ, Gauthier DK, Williams M (1998) The effect of therapeutic touch on pain and anxiety in burn patients. J Adv Nurs 28: 10-20. 31. Koithan M1 (2009) Introducing Complementary and Alternative Therapies. J Nurse Pract 5: 18-20. 32. Lindstrom E, Hansson M, Lundgren E (1998) Analysis of the T cell activation signaling pathway during ELF magnetic field exposure, p56lck and [Ca2+]i-measurements. Bioeletrochem Bioenerg 46: 129-137.